RIGHT. Put down your lamb, everyone, because we need to have a serious chat about Straya Day. 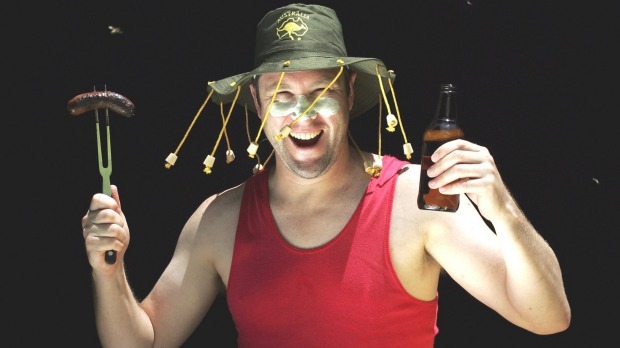 You know Straya Day, it’s that thing that’s happening on Tuesday. It’s that day off we get every January when we all have to wear thongs and drink beer and do things with barbecues while pretending the systematic oppression of generations of indigenous people never happened and everything’s bonzer. News just in: apparently it’s un-Australian to chuck a sickie on Monday to score a four day weekend. That’s according to Business SA chief Nigel McBride, who in Thursday’s Advertiser declared it “un-Australian to rip people off, and that’s what employees taking a sickie on Monday would be doing to their employers”. Which is funny, because I can’t think of anything MORE Australian than that. The only way taking Monday off to be a TV technician for Malcolm Turnbull could be more Australian is if you did it while simultaneously singing Waltzing Matilda, slamming down a beer with a lamington chaser and a getting a Southern Cross tattoo on your neck, right above your Warnie one. Which is a bit sad, actually, isn’t it? That the stereotypical idea of “Aussieness” comes down to beer, pies, cricket, footy, barbies, thongs, being blokey and eating your body weight in meat? Being a woman isn’t particularly Aussie. Unless you’re blonde, and can gad about in a bikini smiling and waving a lamb chop. Being vegetarian isn’t Aussie at all. And if you’re vegan, well, you might as well just hand in your passport now and get packing off to France, or wherever ponces that don’t eat meat hang out and eat lentils. These messages are rammed down our throats every year by the Meat and Livestock Association and their consistently idiotic Australia Day lamb ads, which are hailed annually as iconic displays of what it means to be Australian. This year’s effort features a bunch of blokes in SWAT gear rescuing other blokes from around the world to bring them home to Australia to eat lamb, or something. There’s a bloke in a London pub, another bloke in a business meeting in Tokyo, another bloke in Twickenham (I think he might be famous), another bloke lying poolside in Bali (I think he’s famous too) and a bloke who’s accidentally turned vegan in New York. There’s a woman who’s on screen for about half a second, and someone else who’s supposed to be Princess Mary. And of course, there’s Lee Lin Chin, who has somehow risen above the SBS news desk to become some sort of cult figure, I think because of her jokes on Twitter. Last year’s MLA lamb ad featured Richie Benaud inviting various famous Aussies over for an Australia Day barbie, including Captain Cook, Burke and Wills, Ned Kelly, Sam Kekovich ... and one sole woman, Ita Buttrose. No wonder they needed a barbecue for that sausage fest. And let’s not even mention the utter whiteness of it all. Apart from Chin, there hasn’t been a single non-white person in the last three heavily lauded Australia Day lamb ads. Actually, I was quite impressed at the number of non-white Aussies included in 2012’s “Barbie Girl” ad, until I realised it was actually music group Justice Crew, which was sort of unavoidable given they provided the jingle. Everyone else was whiter than Bondi sand, and all the women were either dancing in bikinis or making desserts. If the annual lamb ads exemplify what it means to be Australian, then please pass the lentils. First published by The Advertiser, January 23 2016. CLICK HERE to read the original article.